The Cook Islands are located North East of New Zealand just east of the International Date Line. It is composed of 15 small islands/atolls. It is on line with Mackay in Australia and is further south than countries such as Vanuatu and the Solomon Islands. It is level with New Caledonia and Fiji. The Cook Islands is an independent nation, but with a close association with NZ. It was a former British colony and as such, has a similar political setup to Australia and NZ. It is certainly not a Third World country, and in fact it is quite sophisicated in its own way. More about this later. The main island is called Rarotonga, with more than half of the population living there. This is a basically round island, just over 32 kilometres in circumference, with a mountainous and jungle interior that rises to over 600 metres. It is surrounded almost the whole way by a fringing coral reef. This reef is located as close as a few dozen metres but at times extends perhaps one kilometre off shore. Rarotonga has the only major town in the country and also its international airport. This has a very long runway capable of handling Boeing-747 jets. The terminal is quite good, about the best I have seen in the Pacific in terms of facilities and cleanliness. The New Zealand dollar is used in the Cook Islands, although they also have Cook Island dollars. They are interchangeable. There are two ATMs in Avarua, on at the Westpac Bank and the other at the ANZ Bank. This is by far the best way to get money if you are not from NZ. Only two international airlines fly to the Cook Islands. The main one is Air New Zealand which has over a dozen flights a week into Rarotonga. These come from Auckland and Christchurch, New Zealand (one a week from Christchurch) and Los Angeles, USA via Papeete, French Polynesia. The other airline is Pacific Blue, an off-shoot of Virgin Blue. It flies from Christchurch once a week (more about this later - I think it now goes via Auckland). Since Rarotonga is on the Air New Zealand NZ/US route and the airline is part of a global network, a lot of backpackers (mostly British or European) who have round the World tickets stop off in Rarotonga on the way to or from NZ. From Australia, you need to get a connecting flight from one of the capital cities to Auckland or Christchurch. Pacific Blue started flying to the Cook Islands in early 2005. From Sydney you can catch a flight about 11 am on Saturdays to Christchurch and the same plane then continues on to Rarotonga, arrving at 12.30 am on Saturday morning (the Cook Islands are behind Australia and New Zealand). This is not as bad as it seems as your internal time clock is about 10.30 pm or 8.30 pm depending on whether you are travelling from Australia or NZ. From Sydney on Pacific Blue it is about a 3 hour flight to NZ and then 5 hours to Rarotonga. I travelled Pacific Blue and the flights were okay, although like Virgin Blue, you have to pay for all food, drinks and video. We paid only A$462 return but this was an introductory price. The normal price is much more, perhaps in the order of A$800. I think that they may now fly via Auckland. I believe that you may also be able to fly from Fiji, perhaps also with Air New Zealand. 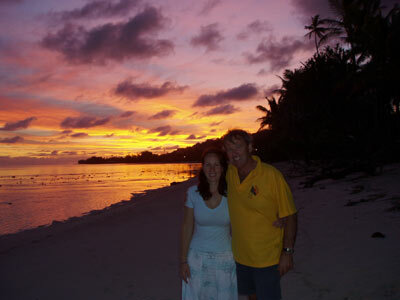 There is a huge range of accommodation in Rarotonga, from backpackers to quality resorts. We stayed at a place I found on the Internet called Paradise Inn. This is located on the eastern outskirts of the island's only town, Avarua. This cost NZ$106 per night (NZ$125 a double) for a self-contained unit, with a double bed in a mezzanine level and toilet, shower and small kitchenette on the bottom. There is also a third bed on this level and small table and chairs. The unit had toaster, fridge, oven top, pots/pans, crockery and kettle. There is also a TV/lounge room and a deck that looks right over the beach and ocean. Note that the beach is not suitable for swimming as the water is too shallow, even at high tide. We found this accommodation excellent and well placed to stores, bars and restaurants/cafes. Highly recommended. As well, there are a number of other resorts such as Club Raro, The Rarotongan Resort, Pacific Resort, Edgewater and many more. Apart from Club Raro, none are close to town, although this should not be a put off in itself. There are some very good shops and restaurants near some of the resorts, especailly those on the western and south-eastern sides of the island. Most of this accommodation is better accessed via a combined airfare/accommodation deal rather than booking separately or on the Internet. Prices start at about A$1500 for 5 nights. There are at least two backpackers. The first is located on the western side past the airport. This is not on the water and is on the inland road. I do not think that I could recommend this location as it is a long way from town and not close to the water. The second is located near the Pacific Resort. This is right on the waterfront at Muri Beach. You can swim in the lagoon, one of the few places in Rarotonga where the water is deep enough and the beach sand rather than coral. Costs were NZ$20 for dorm, about NZ$46 for a double room to about NZ$90 for a self-contained room. Great spot, good looking facilities and with some small but good shops nearby. Also recommended. There is an excellent bus service that operates in both directions around the island during Monday to Saturday, with buses leaving in both directions every hour. The cost is NZ$3 one way or NZ$5 return. The bus only runs clockwise at night and on Sundays. It does not run after 4 pm on Sundays. Therefore, unless you half your own transport, you cannot get anywhere on Sunday night and it can be difficult to get to some places at night (or back) if the place you want to visit is in the opposite direction to the buses travel (meaning you have to go right around the island - almost one hour's travel). There are taxis, but these are few and far between and at night, unless you have prebooked one, you will not be able to find one at all. Fairly costly (NZ$10 a person to airport from Paradise Inn, only three kilometres or so). However, most westerners, even quite old ones, tend to hire motorbikes. These cost anywhere from NZ$12 to NZ$18 a day, depending on the length of hire. No-one wears helmets, in fact the only people we saw with helmets were a group of local pushbike riders on their weekly ride around the island. You can also hire small cars for about NZ$40 a day. There are also "Fun Cars". These have a very small 2 stroke engine, a tricycle undercarriage with trainer wheels on the rear and seating for two. It certainly attracted attention. It had problems making it up the hill to the hospital (where there are excellent views) and it was a bit of an effort to control. Despite this, it was a fun way to see the island. Cost is NZ$40 a day. There are dozens of places to eat on Rarotonga. In the seven nights we spent there, we ate at six different places. All had very good food, some being exceptional. The cost varied from similar to cafes at places like Bondi, Coogee, Manly, Portsea etc in Australia up to NZ$60 to 75 a head at the plusher places. Places we tried were the Whatever! bar. This is located right on Avarua Harbour and has great views over the ocean. There is only a small menu, sirloin and rump steak at NZ$18.50, mini burgers at NZ$5 and fish (similar to the steaks). Beers are NZ$3 to $4 a bottle. Excellent service, very good steaks (my rump was huge, the biggest I have ever had) and cold beer. We ate here twice it was that good. We also ate at Cafe Salsa. This is in the middle of Avarua. It has wood fired pizzas at NZ$14 and dishes like broadbill fillets NZ$22 and gumbo ya ya chicken and shrimp at NZ$15. We had one dinner here and one lunch (pizza). Beers were NZ$5 and wine NZ$7. Mondays, Wednesdays and Fridays the place to eat is the Nu Bar. This is located just east of the airport and as such, from virtually everywhere on Rarotonga you will need transport or catch a bus to get there. On these nights, they have a NZ$10 steak deal. This was quite good and represented good value. The steak was quite tender. Beers were cheap as was ice cream and topping. The RSA (RSL) is just up the road and rocks on Monday and Friday nights. Between Paradise Inn and Avarua township is Portofino's Restaurant. This is an Italian place. We had lasagne NZ$22.50, prawn and shrimp pasta (hot) NZ$21.50 with beers NZ$4 and wine NZ$5. Great food! Recommended. Near the Whatever! bar is the Staircase Restaurant and Bar. This is again on the eastern end of Avarua town. It is also on the waterfront, but the views are not as good as the Whatever! We went here for the Island Night (Thursday and Friday nights). This costs a very cheap NZ$25 for a main meal (steak, chicken or mau mau) and the show. Beers were NZ$4 and wine NZ$6. The show ran for about 45 minutes and was quite entertaining. The food was not as good as other places, but not too bad. On Sunday nights, there is very little open, as the Cook Islands is quite religous. We ended up walking the whole length of Avarua looking (in vain) for somewhere to eat. In the end we headed east for Club Raro which is a few kilometres out of town. It started raining after only a few minutes walking when we saw a sign saying Tamarind House and Open. We walked down the driveway and found a large colonial house that has been converted to a restaurant. This used to be the home of the local manager of the Union Steamship Company. It is right on the beach and has great views of the ocean. We ended up having the biggest night out of our trip. The best garlic bread I have had for a long time, a shared entree of calamari (entrees NZ$8-10), lamb shanks and swordfish (NZ$22-29) and a shared dessert (NZ$9-10). Beers were NZ$5 and wine NZ$5.50. Total cost with a few beers and wines was about NZ$120 for two. A excellent meal. There are many other places to eat on the Muri Beach and western sides of the island as well as the many resorts. Some have very good reports. For lunch there are more places to eat in Avarua. As well as Cafe Salsa mentioned above, there is a fish and chip place on the waterfront at Avatui Harbour (eastern end of Avarua town) that we meant to visit but did not get the time (it smelt great), Mama's Cafe in town (looked okay) and Blue Note Cafe. This last one I cannot recommend. We were taken to a seat and 15 minutes later we still had had our order taken (nor had people already seated when we arrived). I do not mind "Pacific Time" (that is, relaxed server) but this was a joke. We walked out and went to Cafe Salsa where we were served straight away. Our favourite place was Quench Cafe. This was almost opposite Paradise Inn. It had hamburgers and cheeseburgers NZ$5, great hot chips NZ$3.50 and chicken wraps NZ$7. Very good quality and great value. If you have a motorbike or funcar, another option is to get some beer and wine, some nibblies (chips, peanuts etc) and do something special. We headed around the island and stopped at a couple of beaches on the southern side of the island. We had a drink and nibblies and watched the sun go down. The sunset was amazing and we got some excellent photographs (make sure you have a tripod and remote control or timer so you can take photos of yourselves). You could even get a roast chicken and salad from the supermarket in town and have dinner in a romantic place along the way. 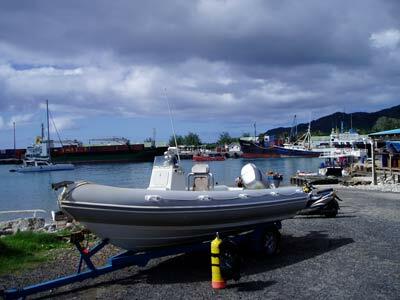 There are four dive operators in Rarotonga. These are Pacific Divers, Cook Island Divers, Rarotonga Divers and the Dive Centre. They all have RIBs (ridged inflatable boats) or similar. Most are rubber ducks with solid fibreglass hulls but one is all plastic hull and one may be aluminium. They all normally launch in Avarua (most from the main ramp at Avatui Harbour but one from Avarua Harbour). On my trip I used Cook Island Divers, the oldest of the shops and in the same ownership since 1973. They are located on the eastern side of the island where they have a training pool, small classroom and drying area. They operate four RIBs. Two are smaller and two larger. All are very well engined, capable of well over 25 knots. Depending on the number of divers, an approriate boat is chosen. 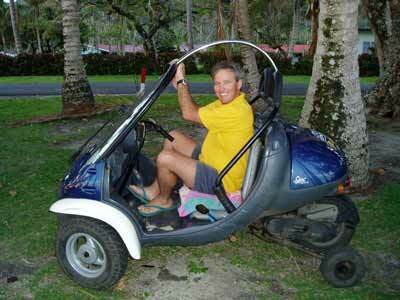 They will pick you up from any location on the island. Pickup times are 7.30 am and 12.30 pm. You are taken back to the shop where you load up your gear into the ute and travel to the launch site. Gear is then assembled and loaded onto the boat and launched (watch out for the ramp, it is slippery as hell, I went over and hit my head hard). Sometimes if the seas are suitable, boats (at least the smaller ones) are launched from the beach on the south side of the island. Dives are double dives, with tea/coffee and biscuits provided in between dives. Cost is disappointing. Double dives are NZ$120, which is the most expensive I have ever encountered apart from Chuuk Lagoon and Cairns. You get a 10% discount if you do more than 10 dives. This still works out at NZ$108 a trip. Considering that the runs are only a few minutes and fuel costs therefore minimal, the cost should be a lot lower. What about the diving? Well, the one good thing I can say is that the visibility was probably the best I have ever encountered. All 10 dives I did had at least 35 metre visibility, with some 40 to 45 metres. The bad thing is that the reef is perhaps the worst I have ever seen anywhere in the world (and I have dived in 11 Pacific Ocean countries). The coral is at least 80% dead, in some places 90%. I have no idea why. On a better note, the fishlife was fair. All in all, I think I can honestly say that the reefs in Sydney are better than the Rarotongan reefs. A pity, since the visibility is so stunning. See Cook Island Dives for more details on the places I dived. Would I dive Rarotonga again? Probably not as it is far too expensive and the reef so poor. There are a number of different bushwalks you can do on your non-diving days. The main one is the cross-island walk. I will not go into detail about this here, but it is well worth doing. It takes four hours and say six hours from the time you leave your accommodation, catch the bus to the start and catch the bus back home. The walk gives great views of both sides of the island. It is fairly difficult and there are a number of places where you can take the wrong track (but you will still end up back on the right track in the end). Recommended. Rarotonga is one of the nicest places I have ever visited. It is a relaxed location, typical of the Pacific, but with excellent infrastructure to make your visit very enjoyable. However, it is not a place to visit for scuba diving, there are numerous better places to go (say Sydney and Melbourne for two) to have good or great diving.